When I need to speak out the most. When my life is the most dangerous to myself. When I feel like I could just scream, a billion times over… I'm stuck with the silence of mental illness! When in all reality I'm not. But, nothing comes out of my mouth, no emotions show on my face or body, and I'm left silenced by the disease of mental illness. The silence is so loud that it's deafening, but the only escape is the say something, anything at all! But what comes out is a fucked up insecurity, only justified by the depravity I put myself through with a slap to the face, and repeat; better known as insanity. The worst commonality with this illness is that the blank faced stare I give people shows them that I am okay, when in all reality I am not! It's like I'm sleepwalking during a vague state of confusion, depression, and agitated anxieties. But, no one can tell when all that I'm showing is blankness, blandness, with an inside being torn to hell like Dante's Inferno reincarnate. I can never seem to get what I'm feeling out, and I truly don't know the worth of a few choice words said differently. And what's really killing me is the esoteric fucked up word, "fine." 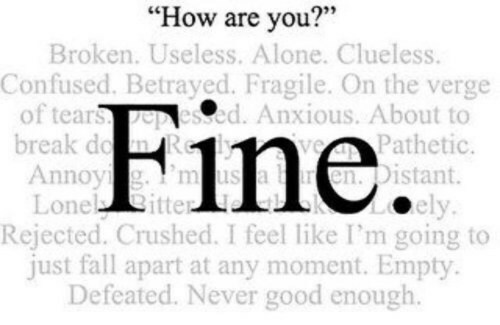 When in all reality, if I was to add one extra word and say, "I'm not fine…" my illness would take a whole new meaning and I'd be heading towards help instead of towards isolation with my own worst enemy; the mind that thinks for me. How do I break free of a blank slate without putting a chalkboard full of loseristic terms on my forehead, as I know I'm not my stigma. I'm only human. You know my struggle, but would you speak out any differently if it were you? And while most of the time I wish it would go away, other times, I bask in the negativity I've grown on myself like a fungus on my undertones; biting and nipping at me while building and encapsulating the wholeness I once had. So if you, or someone you know, is suffering from mental illness and don't know where to speak out, but need help, just know that it's there and all that you have to do is speak out, speak up, and save your own life! Please do share this in efforts that someone who needs help will break their silence and be comfortable to admit that it's okay, to not be okay! It helps you, to help yourself. And by helping yourself you may help someone else just by saying the words, "I'm not okay," because one fact holds true… we are not alone in this battle! I'm living proof of it, and will always be there for you! If in need of immediate help please call the National Suicide Hotline — 1-800-273-8255 (Toll free 24/7/365) It's never too late!